In this article, we bring you the hottest geek room décor ideas for 2018 to help you start the year in style if you tend to believe that a little bit of geekiness hasn’t heart anybody. The Nanoleaf Aurora is the one smart lighting product you actually want to own. 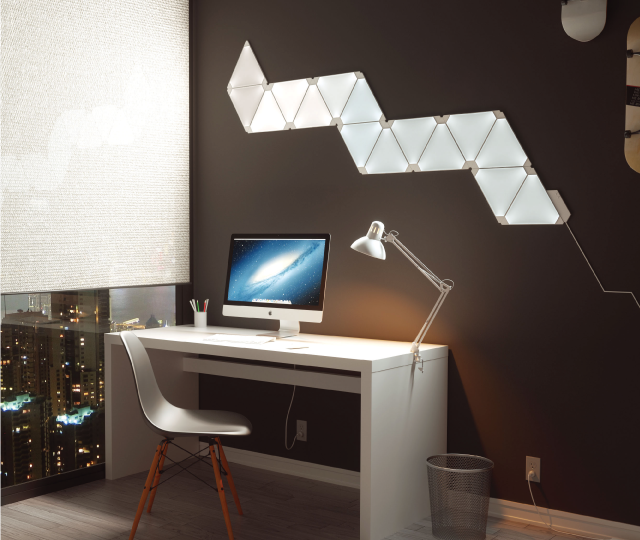 Sold as a convenient kit, the Nanoleaf Aurora consists of triangular panels that can be easily connected together to form whatever shape you would like to create. The panels are fully customizable using a smartphone app, which makes it possible to change their color, brightness, and behavior. You can set schedules or download pre-defined scenes created by other users of the Nanoleaf Aurora. If you would like to make your whole geek room dance to the rhythm of your music, you can add the Rhythm module into any Nanoleaf Aurora light panel. If you embrace smart living, we recommend the Nanoleaf Aurora Smarter Kit, which includes nine Nanoleaf Aurora panels and works with Amazon Echo, Google Home, Google Assistant, Siri, Home Kit, and IFTTT. A single Nanoleaf Aurora system can consist of up to 30 panels, so you don’t need to worry about not having enough building blocks to play with when giving your geek room the lighting makeover it deserves. Get it here. Your desk is the command center of your geek room. A great desk is not just nice to look at, but it’s also nice to sit behind. The Humanscale Float desk goes a step further than that because it’s also nice to stand behind. While sit-stand desks have been around for many years, most of them are wobbly, noisy, or insulting to the eye. With the Float, Humanscale has perfected sit-stand desks by merging minimal aesthetics with the company’s patented counterbalance mechanism that allows the desk to be adjusted up or down while accommodating changing weight loads. All Humanscale desks are built from sustainable materials and recycled steel. The Float doesn’t contain any formaldehyde, which is a highly reactive and highly toxic aldehyde gas commonly found in resins used in the manufacture of composite wood products. The Float is available in many different sizes and finishes, so you should have no problem matching it with the rest of your geek room décor. Get it here. You would probably agree with us that time goes faster in your geek room than in any other room in your house. If you live with a partner, they probably complain from time to time about you disappearing for multiple hours and coming out from your den with a hazy gaze, still thinking about the boss you’ve just defeated or the TV show you’ve binged on. Amazon’s new Echo device, the Echo Show, is the perfect addition to every geek room as it allows your family and friends to instantly connect with you using the Drop-In feature. All they have to do to see what you’re up to is ask Alexa to connect them to your Echo Show, which activates the built-in camera and microphone without you doing anything at all. But don’t worry: you can disable this feature if you don’t like the idea of your relatives and friends randomly creeping up on you. But the Echo Show can do more than just video calls. It can also get you the latest news, find you a recipe for a delicious meal, show you your Prime Photos, help you shop with your voice, or play your music, TV shows, or audiobooks from Amazon’s large content library, among many other things. Get it here. If your shelf and desk space is limited and you’re looking for a place to store your headphones, the Anchor under-desk headphone mount might be the ideal solution for you. Made from premium silicone and reinforced with a heavy-duty steel insert, this handy mount for two headphones uses the same 3M adhesive as GoPro cameras. This ensures that you won’t find it on the floor even if you use it to hold two heavy over-the-ears headphones. To install the Anchor headphone mount, you simply wipe the surface of your desk clean and firmly press the mount to your desk for at least five seconds. To achieve the best adhesion, you should give the mount 24 hours to cure to maximum strength. Apart from its usefulness and understated looks, what we like the most about the Anchor under-desk headphone mount is its price. It costs just $10 and is guaranteed to instantly lessen your cord clutter and protect your headphones from damage—that’s what we call a great investment. Get it here.